A meditation on the cultural representation of comas, using music, poetry and interviews with the families of people who have a suffered brain injury. A meditation on the cultural representation of comas through music, poetry and interviews with the families of people who have a suffered brain injury. There are several thousand people in vegetative or minimally conscious states in the UK and, as medical interventions to save the body improve, numbers are growing. 'What is it like being in such as state? ', 'Is she in there? ', 'Does he recognize me?' 'What should I do for the best?' 'Is this a meaningful existence, or a state worse than death?' These are the questions that haunt families. Using new research from the York-Cardiff Chronic Disorders of Consciousness Research Centre, this programme asks the inevitable question of whether one would choose to die rather than live in such a state, trapped in a 'fate worse than death'. Not dead, but perhaps not fully alive either. 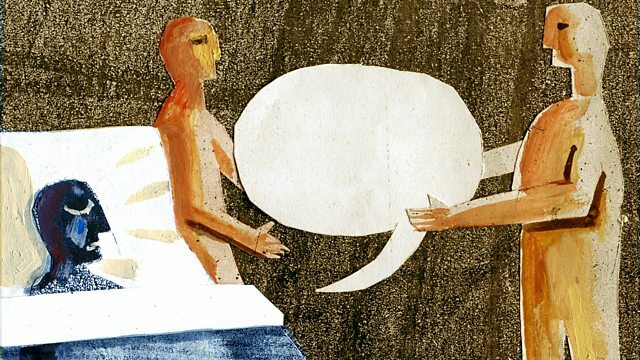 Family members talk with stark honesty about what it is like to have a relative in a coma-like state, unable to speak or do anything for themselves, year after year; their feelings at the bedside and their thoughts about the heart-breaking dilemmas they face. Using words, sounds, music and poetry, the programme explores the surreal and extraordinary situation created by modern medicine's ability to save the body, but not to restore the brain. Produced by Llinos Jones and Professor Jenny Kitzinger. This is a Terrier Productions Ltd programme for BBC Radio 3. Illustration: "Wordless" (detail) by Tim Sanders.